The Saab JAS 39 Gripen (English: "Griffin") is a light single-engine multirole fighter aircraft manufactured by the Swedish aerospace company Saab. It was designed to replace the Saab 35 Draken and 37 Viggen in the Swedish Air Force (Flygvapnet). 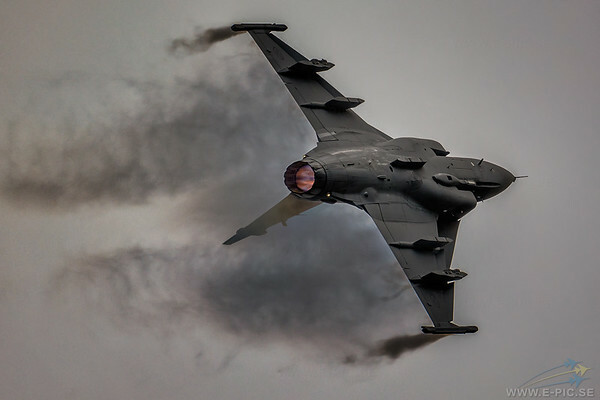 The Gripen has a delta wing and canard configuration with relaxed stability design and fly-by-wire flight controls. It is powered by the Volvo RM12, and has a top speed of Mach 2. Later aircraft are modified for NATO interoperability standards and to undertake in-flight refuelling. JAS 39A: initial version that entered service with the Swedish Air Force in 1996. A number have been upgraded to the C standard. JAS 39B: two-seat version of the 39A for training, specialised missions and type conversion. To fit the second crew member and life support systems, the internal cannon and an internal fuel tank were removed and the airframe lengthened 0.66 m (2 ft 2 in). JAS 39C: NATO-compatible version of Gripen with extended capabilities in terms of armament, electronics, etc. Can be refuelled in flight. JAS 39D: two-seat version of the 39C, with similar alterations as the 39B. Gripen NG: improved version following on from the Gripen Demo technology demonstrator. Changes from the JAS 39C/D include the more powerful F414G engine, Raven ES-05 AESA radar, increased fuel capacity and payload, two additional hardpoints, and other improvements. JAS 39E: single-seat production version developed from the Gripen NG program. Sweden and Brazil have ordered the variant. Rolle out in 2016 and first flight of prototype expected in 2017. Brazil's designation for this variant is F-39E. JAS 39F: two-seat version of the E variant. Eight ordered by Brazil, to be developed and assembled there; planned for pilot training and combat, being optimised for back seat air battle management, with jamming, information warfare and network attack, besides weapon system officer and electronic warfare roles. Brazil's designation for the variant is F-39F.